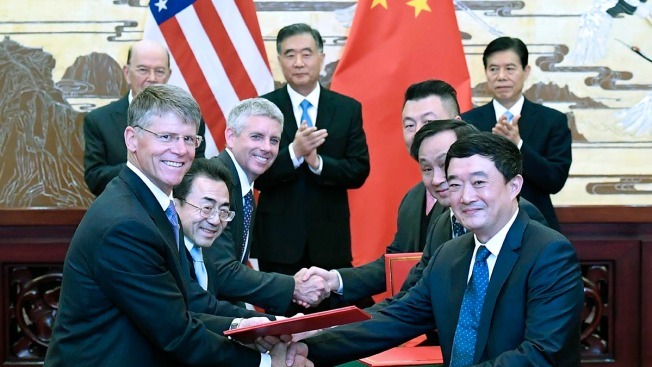 In this photo released by Xinhua News Agency, from behind left, U.S. Commerce Secretary Wilbur Ross, Chinese Vice Premier Wang Yang and China's Commerce Minister Zhong Shan applaud as they witness officials exchange memorandum of understanding during a signing ceremony in Beijing, Wednesday, Nov. 8, 2017. On Sunday, the public learned that Commerce Secretary Wilbur Ross never fully divested himself of ownership in a global shipping company — one with ties to Russia’s rulers — when he joined President Donald Trump’s Cabinet. But new reporting by NBC News shows that Ross’ potential conflicts of interest go even further. The shipping company’s own documents suggest that Ross’ company may benefit from an important initiative that he has led as commerce secretary: securing a trade agreement with China to increase U.S. exports of liquefied natural gas (LNG). Under federal law, it is a crime for an executive branch employee to be substantially involved in specific matters that have a "direct and predictable effect on the employee’s own financial interests," according to the federal Office of Government Ethics.